'Rock Band' Game Amps Up Bar Scene Bars like Whitlow's on Wilson near Washington, D.C., are drawing crowds with an increasingly popular video game called Rock Band. 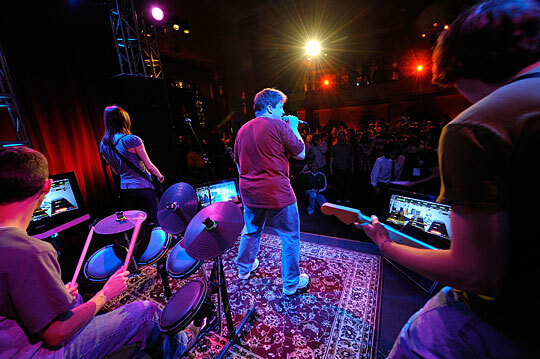 Players can take the stage as rock stars — singing or playing guitar, drums or bass to their favorite hits. Guests at the July 2008 MTV Rock Band Party play Rock Band 2 in the Orpheum Theatre in Los Angeles. Some smaller venues, like bars, have purchased the game to attract more customers. The beer's on tap, SportsCenter's on the flat screens, and the happy hour crowds are building. And patrons at Whitlow's on Wilson Bar & Grill in Arlington, Va., are ready for an evening of karaoke on steroids. "You get to play instruments, you get to sing," says Michael McFadden, the emcee for the night. "There is a singing role — but there's drums, two guitars and plenty of people who've done it before already." Some of the random stragglers at the bar have already formed their "bands" for the night. 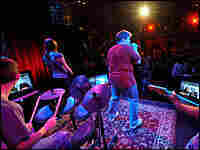 Rock Band is an increasingly popular music video game that allows players to take the stage and simulate live rock performances. One player covers vocals, while the others handle guitar, bass and drums. McFadden says the crowds have definitely gotten bigger since the bar started letting patrons rock out. "You get the shut-in geeks — video gamers who've come out for their one night out," he says. "And there's beautiful girls out here — and you see the interaction between them." Jonathan Williams, who runs the bar, says the $400 it cost to buy the Xbox paid off, because it gets people to stay in his bar. "Let me put it to you this way," says Williams. "If you and I are hanging out here, and we get here at 9 o'clock and drink a couple of beers, by 10 o'clock, we might consider getting up there. And by 11 o'clock, you can be sure we're going to be up there playing air guitar." And for the gamers who are new to navigating the happy hour jungle, there's a lesson in common courtesy. "I don't know how much you drink when you play Rock Band at home, but here you gotta tip your server," says Williams. The Xbox, however, requires no tips — and it plays on until last call.